The InsuCalc wheel is a portable, easy-to-use, and accurate pre-meal insulin bolus dosage calculator proven to help maintain control of blood glucose levels. The InsuCalc wheel was designed by a practicing pediatric endocrinologist at a major academic medical center, where it has been in clinical use for many years. In a randomized control trial of adolescents, consistent use of the InsuCalc device improved HbA1c levels (PubMed). In addition, the InsuCalc wheel has been featured in the magazines Diabetes_Forecast and Diabetes_Health. 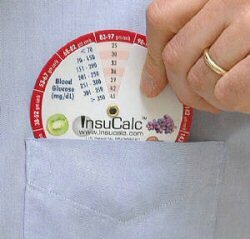 InsuCalc wheels come in 12 different combinations of insulin:carbohydrate (I:C) ratios and blood glucose correction scales. These will accommodate most individuals with diabetes on "multiple daily injection" or "basal bolus" insulin regimens. InsuCalc wheels are not sold to individuals with diabetes. They are offered only to diabetes healthcare professionals, who can instruct their patients on the proper use of the device and monitor its effectiveness.